When your sewage system is backed up, it can result in the need for a lengthy and expensive repair process. A couple of decades ago, even the simplest sewer line problems were highly disruptive and took several days to fix. However, as homeowners across the country are learning, there is now a more affordable, efficient and environmentally friendly way to fix your pipes and restore your home’s plumbing service, and at Roto-Rooter Ventura, we are proud to offer trenchless sewer repairs to our customers across the region. Advancements in sewer technology have made digging obsolete by allowing sewer system technicians to repair leaks, cracks, and breakages from the inside of the pipe. 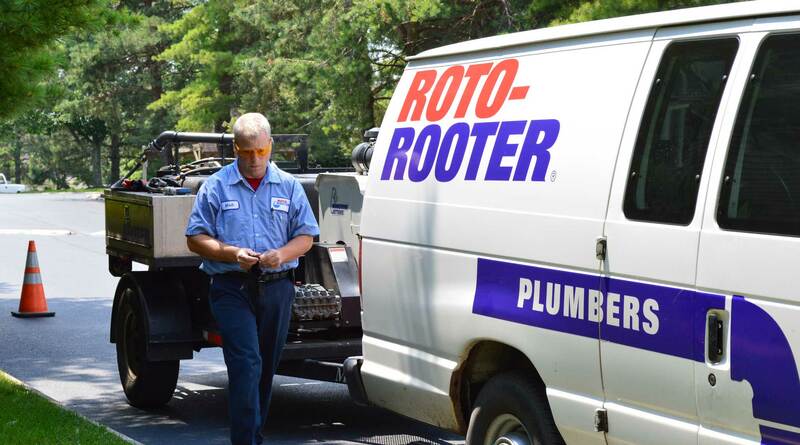 At Roto-Rooter Ventura, we conduct this process in four simple, but effective stages that maximize its effectiveness and ensure that our customers are satisfied with the end result. Step 1: The process starts with a video inspection, during which one of our Roto-Rooter Ventura technicians will examine pipes and pinpoint the location of any trouble spots. Step 2: Next, our technician will clean out the pipe using a specialized, highly pressurized stream of water that breaks up debris and helps restore the pipes to their original diameter. Step 3: After cleaning the pipes, we will insert a flexible tube coated with a liquid epoxy resin into the pipes, then inflate the liner to fill your blocked or damaged pipe. Once it has fully cured, the hardened resin forms a sturdy new pipe within your existing line. The smooth interior surface of the liner often increases the flow capacity of the pipes. Step 4: As a final precaution, our technicians will conduct an additional video inspection to verify the repair has solved the problem. Trenchless sewer replacement, also called cured-in-place pipe, is a long-lasting sewer repair process that has many outstanding benefits. Saves time and money: The entire trenchless repair process usually takes less than a day and requires fewer workers than traditional techniques, which makes it more affordable. Minimally invasive: One of the biggest benefits of trenchless technologies is that the process requires little to no digging. Sometimes, a deep dig can unearth buried toxins, which may then become re-deposited in soil or water sources located downhill from the original dig site. Going trenchless mitigates the risk of exposing these deposits and having them infiltrate the water supply. New pipes waste less water: Leaky pipes will become an increasingly serious problem as drought conditions become more frequent due to climate change. Less heavy machinery: Going trenchless also requires much less time and equipment to complete repairs than a traditional pipe excavation, therefore creating less pollution. No property damage: A trenchless sewer repair only requires small access holes, rather than a full-scale excavation that causes long-term property damage and kills plants and animals in its path. Environmentally friendly: In a traditional sewer repair, old metal or PVC sewage pipes are thrown away in a landfill. Trenchless technologies are a greener solution because the existing pipes are re-used to attach and cure the resin liner. As another benefit, the new pipe is highly durable and long-lasting, which lessens the chances of needing additional repairs in the future. When you need the highest-quality repair services in Ventura County, call our team at Roto-Rooter Ventura. Our experienced, licensed technicians are highly trained and use all the newest techniques and equipment. Since we offer a written service guarantee, you can feel good about trusting your home’s or business’ pipes to Roto-Rooter Ventura. A few years ago, even a simple problem with a sewer line meant having to spend days to fix it. Pipes would need to be dug out, repaired, and covered back, which was a costly process. It also meant having to interrupt the water service in the home, so any occupants would need to spend several days at a relative’s house or renting a hotel room while the repairs were finished. Nowadays, plumbing technology has made digging obsolete, and by using a trenchless sewer repair, the pipes can be fixed from the inside. This is how it is done: first, a small video camera is sent into the pipes. As it travels along the plumbing system, it sends a live video feed to an external monitor, where the technician can evaluate the condition of the pipes and locate any cracks, broken pieces, or loose joints which may be leaking water. One the problematic area has been diagnosed, the pipe needs to be cleaned out. This is usually done with specialized nozzles that blast any debris with a high-pressure water jet. Not only does this remove any sludge from the pipes, but it also restores their original diameter. After cleaning the pipes, a felt liner coated with epoxy is pulled or pushed into place and inflated. Once the epoxy cures and hardens it acts as a pipe within the pipe, sealing any leaks and replacing any missing or broken pieces. As a final precaution, an additional video inspection is done to verify that the repair has been done correctly and the problem has been solved. This whole process can be done in less than a day and requires less workforce than traditional trench digging, which makes it more affordable. In some cases, it can also improve the sewer system’s function due to the smooth interior surface the liner has, which can increase the flow capacity of the pipes.